How Does High Vis Work? Give drivers the best opportunity to see you when you are cycling day, dusk and especially at night by making yourself bright – fluorescent for day and reflective for night. Does High Vis Make Me Safer on My Bike? Wearing high vis will never guarantee your safety but along with other measures it can help. It’s ultimately up to drivers to be paying proper attention but you can help them by making yourself easier to see. This is especially important in poor light conditions such as in bad weather, at dawn, dusk or night. Bright (ideally fluorescent) colours show up in daytime and near dusk. Light (ideally reflective) materials show up after dark. To be seen day, dusk and night make sure you are ‘high vis’ with fluorescent and reflective elements in your clothing, bags or accessories. For more information on how fluorescent and reflective materials work see our ‘Be Bright Be Seen’ section. Do I Have to Wear High Vis When Cycling? Wearing high vis when cycling is your choice (or your parents’ choice if you are a child… and we’ll come that in a minute). It is not a legal requirement in the UK, unless you are in a workplace environment that requires it as part of PPE (personal protection equipment) rules. If you are a parent and want your child to wear high vis when cycling but they really don’t want to, consider this – if they are cycling they are improving their life and health chances so stopping them from cycling could actually have a more harmful effect than letting them go out without high vis. Ensure they have good cycle training, lights on their bike… and maybe don’t buy them a black jacket this year. If you carry a dark rucksack over a high vis jacket you will not be seen so easily from behind – consider getting a high vis rucksack. Alternatively a high vis rucksack cover can cover your bag and provide additional benefits by protecting your bag from rain. 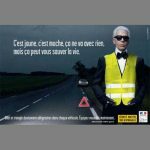 Do your high vis jacket up – by having your chest covered with high vis you will help drivers approaching from the front to see you. Keep it clean – dirty high vis won’t show up as well and high vis is usually machine washable. After 25 washes most high vis with silver-grey reflective tape is best replaced as the reflectiveness decreases. Bling your bike too! 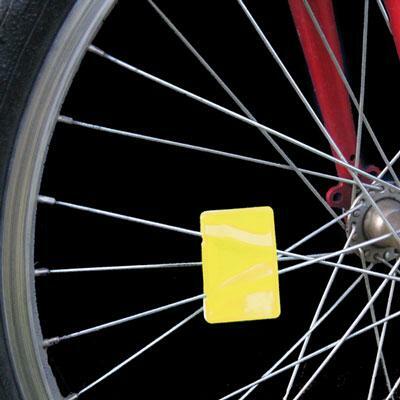 By putting durable high vis stickers on your bike you will help make your frame permanently bright (and you won’t have to think about it every time you go out). By brightening your frame it will be easier for drivers to see you when approaching from the side. Encourage your children. High vis isn’t just for builders… make sure your children are bright on their bikes too. Lead by example and also let them have a say in which high vis they have – it doesn’t have to be yellow; pink is very popular with children. Make sure you have cycle lights too… in the UK they are a legal requirement after dark; they help you to see and be seen. Why is it called the “school run”? Walking blog – it’s my life! Are you interested in inspiring more children to walk to school, cycle or scoot? If so, sign up for our regular enewsletter featuring events, initiatives, product news and exclusive offers from Brightkidz. Copyright 2019 © Safe Kids Walking Limited. All rights reserved.